Is there an acting gene that is particular to people with Down syndrome? 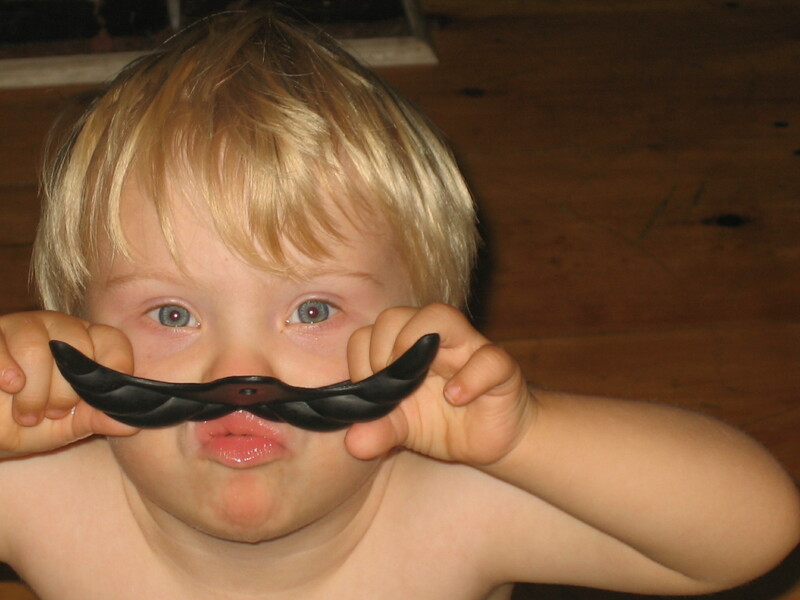 T’s therapeutic foster mom had told us that Down syndrome kids are great mimics. We would find out for ourselves how true that was. I can’t find any scientific evidence if of but plenty of anecdotal examples reside on-line including a 5-year-old who has taken to re-enacting an epileptic seizure they witnessed at school. (Do you laugh or cry?.) Another site refers to this possible phenomenon as the “acting gene”. Can it be a selling point in the awesomeness that is Down syndrome? “Yes, your son has Down syndrome but he just might act the pants off the likes of Brad Pitt later in life.” (I know Brad has taken some critical hits over the years but his roles in 12 Monkeys, Floyd the honey bear bong smoking stoner in True Romance, Fight Club and even Burn After Reading are indelible performances not to be missed and T. is that good looking) And – why do I think Brad Pitt needs me to defend his career choices – he’s a movie star for Pete’s sakes! The first we noticed T. had this propensity was at a dinner party. Our friend was relating a story and she used an idiosyncratic gesture that wasn’t readily apparent until T. started imitating her. She held her left hand across her chest and cupped her right elbow in her left hand. With her right arm she motioned forward with her hand making substantive points. While she was speaking, the rest of us noticed he was making the exact gesture. He was not just imitating her but imbuing the gesture with the same intention, which was “I am quite confident in my point of view”. There was a lot of laughing when it was acknowledged. For days after T. used that gesture when making a substantive point of say requesting ice cream. T. can do a spot-on imitation of our German Shepard doing anything. He has taken to sleeping at the end of the bed curled up in a ball and drinking out of the dog‘s water bowl. Charming and very Wild Boy of Aveyron. I suspect one of the teachers at his school throws a sweater, shirt or some article of clothing over their shoulder casually – not unlike Frank Sinatra posing on an album cover. He can imitate dance numbers that inspire strangers to stop and say things like, “He can really move!” Yes, to the question have I ever watched So, You Think You Can Dance? with him. He thinks passionate kissing is a fine way to say “good bye”. We have heard over and over again from therapists that this curiosity in behaviors will serve T. well in terms of learning. He is unconsciously picking up behaviors that are for the most part helpful. Sure, I would rather he stop open mouth kissing our miniature dachshund but I am relieved to see that he thinks cleaning up after yourself or toilet training are worthy pursuits because he sees his friends at school doing these same things. This entry was posted in Adopting, By Notatypicalmom, Down syndrome, Foster care, Special Needs by Kari Wagner-Peck. Bookmark the permalink.